Children are always curious as to why certain things happen. They enjoy making new discoveries and to take on tasks that may seem cumbersome to the adult. Children when encouraged blossom with a multitude of possibilities. A child that is desirous of something will do everything within their power to acquire that toy or snack from the parent or another child. Children do not give up easily; they find ways to keep themselves entertained and happy no matter the limitations of their environment. My work with children had always bordered on creating every day learning experiences that will not only teach these new ways of working but will make them happy, entertained and promote a holistic lifestyle. 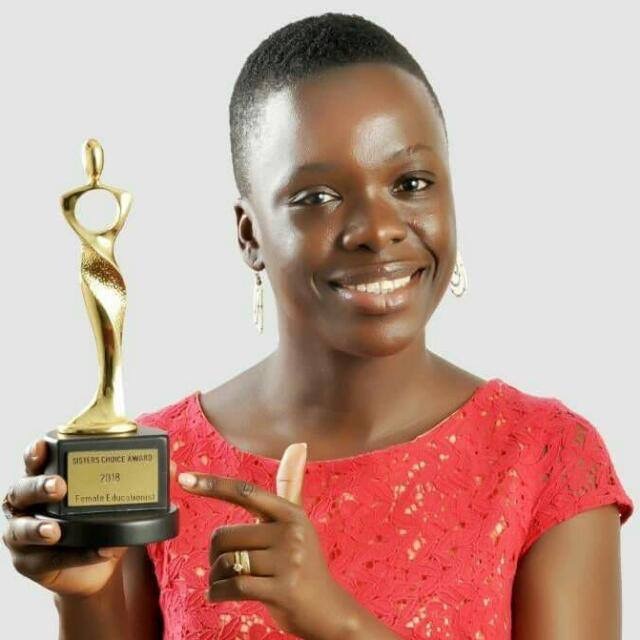 I was delighted when I learnt of the Network Teaching Children (NTC) program, it was the holistic representation that I had of the preparations that must be made for our children; pre-birth, birth and through the foundational stages which will nurture and create the whole child. 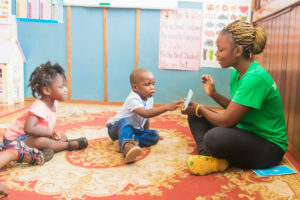 The Program fosters overall child development, but focuses on cognitive development with a main aim of learning children to think both creatively and functionally. The main focus of the NTC program is the development of functional knowledge and this is so empowering in terms of introducing good habits which is the foundation for healthy lives and relationships. NTC caters to and embraces teaching moments for all, starting with the ‘pregnant woman’ which supports the formation of a healthy child. Embryos represent a life forming stage and habits are formed whilst in the womb. A baby in the womb can begin to hear sounds at about 17 week’s gestation, at around the time when the mother begins to feel the flutter in her womb. Numerous researches have shown that children that are introduced to music early on in life have progressive brain development as their auditory systems mature faster. The program specifically addresses some ways of caring for children that are wrong and these are termed as first mistakes by NTC. Let me highlight few examples; let’s start with the culture of delaying the weaning process and discouraging solid foods in babies and toddlers. Breast milk is ideal for babyhood stages but once the child has developed the physical requirements for chewing and digesting solids they must be introduced to solids that will promote chewing, salivation and mastication. 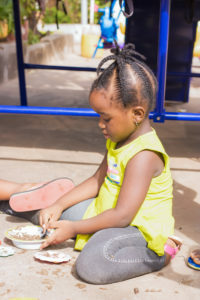 Children that chew on solids early on will have more control of their tongue, they will pronounce better, approach phonics, reading, talking- readiness and pre-language skills better prepared. In fact, studies have shown that mastication is of great importance for the systemic, mental and physical functions of the body. More and more attention is being paid to the studies that examine the importance of chewing for cognitive functions. We are always concerned about presenting beautiful nurseries and spaces when welcoming a baby. We take time out to re-model our houses, paint and furnish accordingly. We have particular colours to suit different sexes, the typical blue for boys and pink for girls. This decision restricts the child to one particular colour for the first few weeks of her life as she spends most of her days in the nursery. More importantly, the habit has a negative impact on the development of specific brain regions. NTC recommends exposing the child to different colours, shades and patterns; and contrasts that excites the eyes and encourages development. In the modern society as growth progresses the toddler is restricted to certain forms of play that would keep them clean, prevent them from falling down, injuring themselves or being uncomfortable. I believe that children must be left to make discoveries from themselves under guided supervision. Children must be encouraged to use their hands more, rather than opting for slouchy positions on the couch using technology such as the tablets, electronic gadgets etc. Long hours watching television or playing electronic games reduces the child’s ability to interact socially, causes behavioural problems, stunted motor- skills that inhibits good writing skills and health problems such as stiff neck, sore thumbs and poor eye- sight conditions i.e. to name a few which is not to be compared to that time spent playing outdoors or in the woods or in open spaces. Even walking is enhanced when children play outside as they can coordinate better when they walk on abstract surfaces that have uneven levels and other obstructions lay out on the ground. At my early learning centre- Narnia Daycare- we have seen marked improvement in children as soon as we have started implementing the NTC (the first part of the Program) through activities designed as games, thereby spending time outdoors breathing in fresh air and taking in elements of nature. Children find ways to play with each other and for longer. They become more creative in terms of developing new games and creating tools that help them play. The children have an improved vocabulary that can never be acquired when they stay restricted in the same room hour after hour. Nature is dynamic and changes constantly. 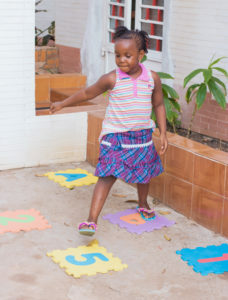 Traditional games (hopping, skipping rope, hopscotch, marbles…) that contain elements of rotation, balance, coordination, fine motor skills, as well as activates of abstract classification, seriation, and association must be re-introduced because they simultaneously activate different brain regions, positively affecting brain development. Moreover, numerous studies have shown that there is a direct correlation between motor development, especially aerobic fitness and cognitive functioning. Additionally, traditional games. 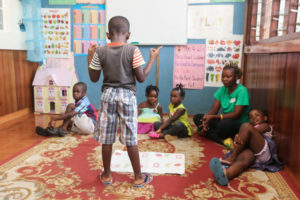 In Sierra Leone, Narnia Educational Group has started programs that educate children on the games of the olden days ones that involve: pebbles, stones, marbles, rubber-band, stoppers. We are re-visiting and re-designing games that involve crawling, clapping, skipping, jumping, climbing, through our work with NTC. Narnia wants to capitalize on the value presented through research conducted by the Network Teaching Children with groups of children from around the world; These games stimulate the integration of motor and cognitive function and which in turn helps with critical and quick thinking processes, motor-skills development and a platform that provides great interaction which is great for the development of the whole child. Children that are introduced to this system have brains that have more interest in creativity and innovation, critical skills that are encouraged globally. Our ways of working with children have become more positive and are generating more results, by re- programming our language and initial approach to setting the class scene. Instead of cultivating children who are scared of learning we are breeding intelligent children who enjoy learning, exploring, thinking and making new discoveries. We are amazed at how the children absorb information and are able to transmit what they learn in everyday life and with their peers using the different learning materials that NTC has produced and adapted to encourage and steer giftedness. This system of education does not only prepare the child but it supports the family and the community by presenting great opportunities where children develop better social habits and behavior. One great example is the culture of reading; Narnia embraces the need to discover new worlds, behaviours, phenomena and vocabulary just with the turn of a page. 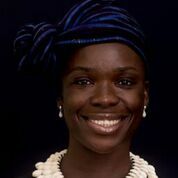 We develop skills which are otherwise dormant or just attributed to smartness. We as all know how quickly a child can recognize landmarks or recognize the symbols of their favourite characters, foodstuff (juices and cookies). One such way is by introducing sensitive subject areas as games and quantifying them as fun. Try using this phrase before doing homework today; ‘Let’s come and play‘. When we invite the children to play or say let’s have fun or today’s game is ‘xyz’, an aura of excitement is generated at the start of an activity or lesson which alerts the senses and gets them ‘hot’ wired for learning. Another technique is to focus on the imagination. Create games around objects found around the house/ environment. Simple pictorial representations with patterns, symbols and logos. The main aim in these games is the development of functional knowledge by practicing associative thinking, abstract classification and seriation. In this process memory skills can be mastered. Example: Collect plastic bottle tops/ cereal boxes and talk about the colours, shapes and symbols. Use them as counters and in memory games. Our sessions and programs with the kids are far more rewarding for our teachers and caregivers as it has become more exciting and enjoyable. Most of our activities actively involve the instructor in terms of critical thinking and problem solving. The most interesting fact is just how open children’s minds are in terms of analyzing and presenting information. We are always surprised at the responses that we get especially with the riddles and enigmatic questions or how they interpret illustrations or create stories. The children that complete our programs have developed good communication skills. They have a wide imagination. 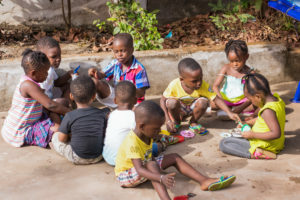 We are confident that our partnership with NTC will not only benefit children in Sierra Leone but it would promote a new sense of ownership in terms of early childhood education in Africa.